The crime wave of the 1960s - it was the hippies' fault. ...I think Wilson was on to something when he linked the 1960s crime boom to a kind of intergenerational decivilizing process. The backsliding, to be sure, did not originate in the two prime movers of Elias’s Civilizing Process. Government control did not retreat into anarchy, as it had in the American West and in newly independent third-world countries, nor did an economy based on commerce and specialization give way to feudalism and barter. ...the psychological change toward greater self-control and interdependence—came under steady assault in the counterculture of the generation that came of age in the 1960s. Together with self-control and societal connectedness, a third ideal came under attack: marriage and family life, which had done so much to domesticate male violence in the preceding decades. The idea that a man and a woman should devote their energies to a monogamous relationship in which they raise their children in a safe environment became a target of howling ridicule. That life was now the soulless, conformist, consumerist, materialist, tickytacky, plastic, white-bread, Ozzie and Harriet suburban wasteland. I don’t remember anyone in the 1960s blowing his nose into a tablecloth, but popular culture did celebrate the flouting of standards of cleanliness, propriety, and sexual continence. Pinker doesn't consider the Vietnam war, which ended in 1975, as a major driver of young peoples' attitudes. Perhaps because he is Canadian and never in any danger of being drafted. But he has plenty to say about naughty rock and roll album covers and Keith Moon. 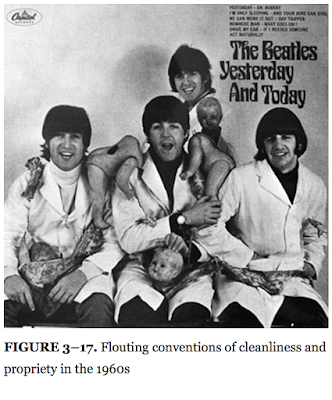 One could trace the reversal of conventions of propriety on album covers alone (figure 3–17). There was The Who Sell Out , with a sauce-dribbling Roger Daltrey immersed in a bath of baked beans; the Beatles’ Yesterday and Today, with the lovable moptops adorned with chunks of raw meat and decapitated dolls (quickly recalled); the Rolling Stones’ Beggars Banquet , with a photo of a filthy public toilet (originally censored); and Who’s Next , in which the four musicians are shown zipping up their flies while walking away from a urinespattered wall. The flouting of propriety extended to famous live performances, as when Jimi Hendrix pretended to copulate with his amplifier at the Monterey Pop Festival. Throwing away your wristwatch or bathing in baked beans is, of course, a far cry from committing actual violence. The 1960s were supposed to be the era of peace and love, and so they were in some respects. But the glorification of dissoluteness shaded into an indulgence of violence and then into violence itself. At the end of every concert, The Who famously smashed their instruments to smithereens, which could be dismissed as harmless theater were it not for the fact that drummer Keith Moon also destroyed dozens of hotel rooms, partly deafened Pete Townshend by detonating his drums onstage, beat up his wife, girlfriend, and daughter, paid a thug to break the fingers of a keyboardist of the Faces for dating his ex-wife, and accidentally killed his bodyguard by running over him with his car before dying himself in 1978 of the customary drug overdose. Many young men decided that they ain’t gonna work on Maggie’s farm no more and, instead of pursuing a respectable family life, hung out in all-male packs that spawned the familiar cycle of competition for dominance, insult or minor aggression, and violent retaliation. The sexual revolution, which provided men with plentiful sexual opportunities without the responsibilities of marriage, added to this dubious freedom. ...A large proportion (today a majority) of black children are born out of wedlock, and many grow up without fathers. This trend, already visible in the early 1960s, may have been multiplied by the sexual revolution and yet again by perverse welfare incentives that encouraged young women to “marry the state” instead of the fathers of their children. Against his better judgment, Livingston ordered the sleeve into production. Three quarters of a million albums were printed, with a reported 60,000 copies sent to media contacts and retailers in advance of the June 15th release date. Predictably, most balked at the gory cover. "Word came back very fast that the dealers would not touch it. They would not put the album in their stores," Livingston said. Lennon, however, remained defiant. "It's as relevant as Vietnam," he said during a press conference at the time. "If the public can accept something as cruel as the war, they can accept this cover." Notice the reference to Vietnam. And at the time of the photo shoot in March 1966 three of the four Beatles were married and in three years Paul McCartney would marry the woman who would be his wife for the next twenty-nine years, ending with her death from cancer. So how can we explain the recent crime decline? Many social scientists have tried, and the best that they can come up with is that the decline had multiple causes, and no one can be certain what they were, because too many things happened at once. 154 Nonetheless, I think two overarching explanations are plausible. The first is that the Leviathan got bigger, smarter, and more effective. Then it's just, people got tired of crime. Steven Pinker really didn't like 20th century pop culture. He thought modern art was crap and he thought that rock and roll music was grungy and disrespectful and decivilizing. He claims to be a member of the baby boom generation but he sounds like their grandparents. ...originally intended for a rock opera Townshend had been working on, Lifehouse, which was a multi-media exercise based on his followings of the Indian religious avatar Meher Baba, showing how spiritual enlightenment could be obtained via a combination of band and audience. The song was written for the end of the opera, after the main character, Bobby, is killed and the "universal chord" is sounded. ...in an April 2006 editorial for Time magazine, retired United States Marine Corps Lieutenant General Greg Newbold referenced the song, labeling it an "antiwar anthem" that "conveyed a sense of betrayal by the nation's leaders, who had led our country into a costly and unnecessary war in Vietnam. Seems like everybody but Steven Pinker gets the connection between 1960s pop culture and the Vietnam War. And it made for a hell of a live stage performance. Unfortunately the video above has been removed from Youtube. Here is another one, which is not quite as good - Pete Townsend is slightly less hyperkinetic in this one and there's no knee-sliding across the stage heading right at the camera. At least there's plenty of Townsend's trademark windmill guitar playing. Although I was disappointed that he refrained from another trademark - often at the end of the line "you know that the hypnotized never lie" he would yell "do yah!" at the audience. Not this time, alas. Keith Moon died at 35 and John Entwistle died at 57 but Daltry age 73 and Townsend, 72 are both still alive. They certainly got plenty of exercise back in the day. And here is a performance of "Happy Jack" by the Who with nice footage of a wailing Keith Moon.